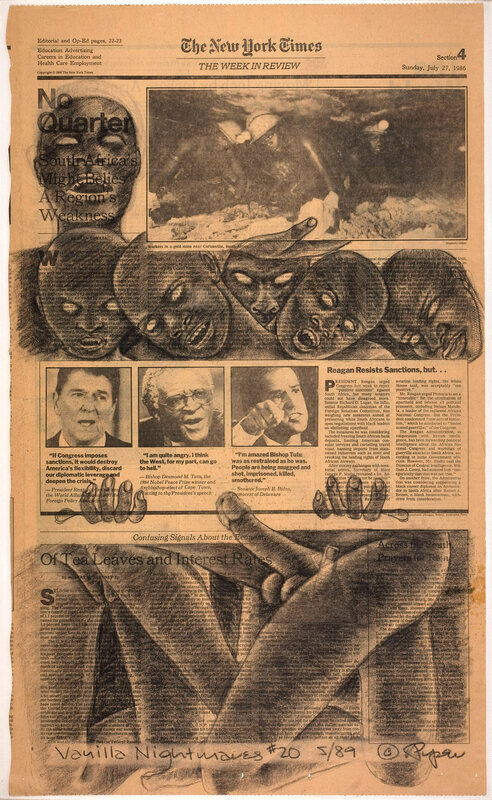 For her Vanilla Nightmares series of charcoal and crayon drawings, Adrian Piper appropriated pages from the New York Times and added figural scenes that complicate and contradict the newspaper’s discussion of racial issues. The opposition between the articles and the drawings emphasizes the white privilege that typically underlies the newspaper's point of view. "Vanilla Nightmares #20." Take It or Leave It: Institution, Image, Ideology Digital Archive. Los Angeles: Hammer Museum, 2017. https://​hammer.ucla.edu/​take-it-or-leave-it/​art/​vanilla-nightmares-20/​.